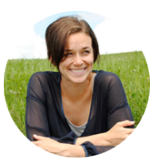 What are participles & participial phrases? 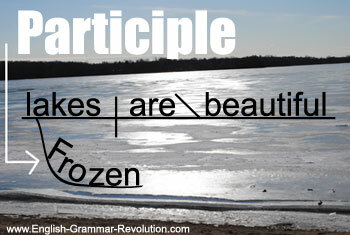 Participles are words that are formed from verbs but act as adjectives. You could say that they have identity issues. Words that are formed from verbs but don't act as verbs are called verbals. There are two other kinds of verbals: gerunds and infinitives. They act as adjectives, and they end in -ing, -d, -t, or -n.
Adjectives are words that describe nouns and pronouns. Here are some examples. Notice that each one is made from a verb but is modifying a noun. Since these guys act as adjectives, they're diagrammed in a very similar way to how adjectives are diagrammed. 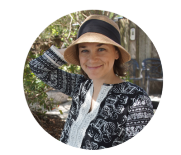 It's easy to see that they modify nouns and pronouns because they are diagrammed on a slanted, curved line underneath the noun or pronoun that they modify. The filtered water tastes delicious. 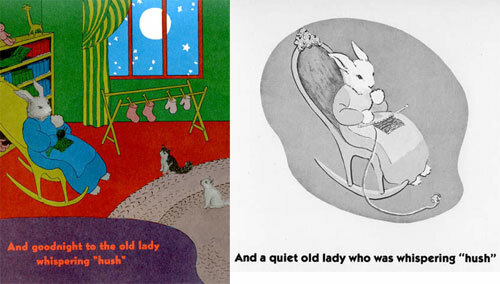 Phrases are groups of words, without both a subject and a verb, functioning as a single part of speech. 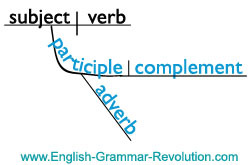 Participial phrases consist of a participle along with all of its modifiers and complements. Here are three examples. Notice that each phrase is modifying a noun. Babies crying in the night bother me. The participial phrase is crying in the night. It modifies the noun babies. Food frozen for over five years tastes icky. The participial phrase is frozen for over five years. It is modifies the noun food. Burned on each side, the toast was inedible. The participial phrase is burned on each side. It modifies the noun toast. 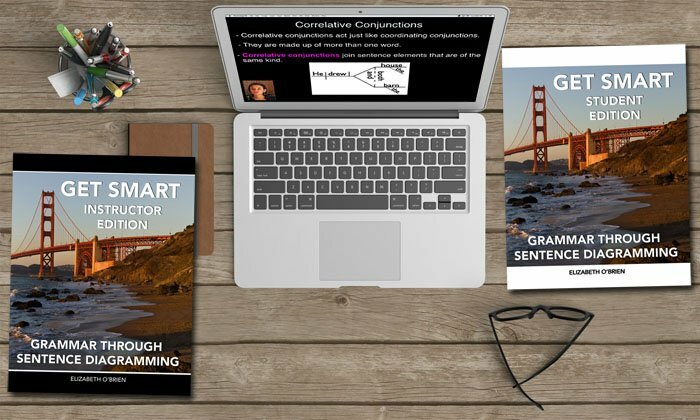 Psst… See how participial phrases are similar to adjective clauses. 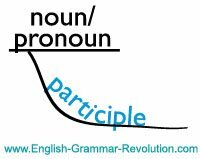 When diagramming these, start by identifying the participle and the noun that it is modifying. You already know that you diagram it by putting it on a curved, slanted line under the noun that it modifies. After that, find out what the rest of the phrase consists of and diagram it accordingly. Throwing rocks across the water, my friend smiled. Step 4: Figure out what the rest of the phrase is doing. 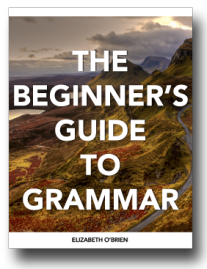 Learn more diagramming, and become more awesome by checking out these English grammar exercises. This is where your other grammar knowledge comes into play. In order to diagram this, you need to know that rocks is a direct object and across the water is a prepositional phrase. This prepositional phrase is modifying throwing. That means that we diagram the prepositional phrase underneath throwing. 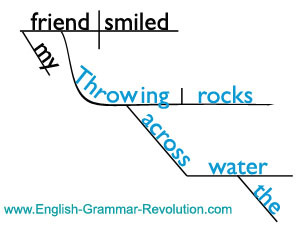 Diagram rocks as if throwing is a normal verb. When a participial phrase doesn't have a noun or pronoun to modify, it dangles. 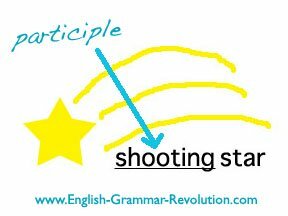 This is called a dangling participle. Click on that link to learn more. Elizabeth, I am ecstatic with the grammar program. I am working on lesson 6 already. I just received your books, and they are fabulous. Thank you, thank you. I know I will be the grammar queen by the end of the summer holidays. This helpful worksheet has some great exercises, but it doesn't have the answers. I think it will still be good practice for you, though! Are you ready to move on? Go back to Phrases.